This is the favorite recipe using Eagle Brand milk – the magic is that you can create a cookie without eggs – and they taste great! Press crumb mixture firmly on bottom of 13X9-inch baking pan. Pour EAGLE BRAND® Condensed Milk evenly over crumb mixture. Cut into bars or diamonds. Store leftovers covered at room temperature. You can also substitute chocolate chips or nuts with: candy coated pieces, dried cranberries, raisins, mini marshmallows or butterscotch chips. Dip the pretzel in the frosting and twist and pull the pretzel out of the frosting. Bake in three 8-inch round pans. Reduce the baking time listed by 5 minutes. While the cakes cool, cut a 9-inch circle from cardboard. Then cut out a 6-1/2 inch circle from the center, leaving a 1-1/4 inch wide ring. This will be the hat brim of your Magician’s Hat. Cut the same size ring from waxed paper and attach to the cardboard with a glue stick. Cut out two bunny ears from white construction paper, and two inner ears from pink construction paper. Place a toothpick on the white ear so half of it extends below the ear. Now glue the pink inner ear on top of the white, sandwiching the toothpick in between. Assemble the 3 cake layers, putting more frosting, jam or pudding between the layers. Frost the cake and also cover the ring with frosting and place it on the cake. Smooth the frosting over the cake and ring so they look like one piece. 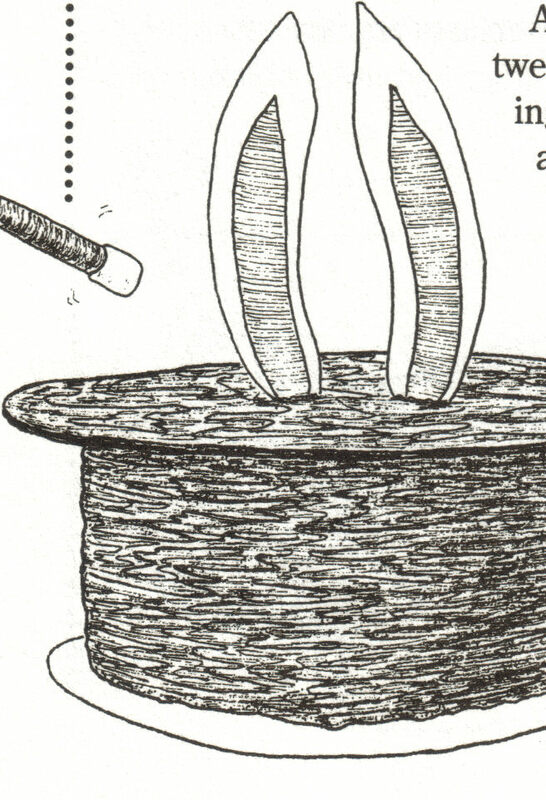 Place the rabbit ears in the center of the cake. Now you have a Magician’s Hat, complete with the Rabbit! Watch out for Peanut Allergies! Beat together cream cheese and honey until well mixed. Stir in peanut butter; mix well. Using a microwave, melt chocolate and vegetable oil in a glass, liquid measuring cup for 1 1/2 minutes; drizzle over pie. Chill 4 hours. Refrigerate leftovers. Magic Pie, It makes its own crust! Place all ingredients in a blender and combine thoroughly. Grease and flour 10" deep dish pie plate. Pour mixture into pie plate and bake in preheated 350-degree oven for 30 to 40 minutes or until set. "Pie" will make its own crust as it cooks. Abracadabra – Bigger Edible Wands! Melt the white chocolate with shortening. Then roll the pretzels in candy or sugar. Mix the drink mix with 1 ½ cups water. Pour mixture into an ice cube tray and freeze solid. To serve, pour the soda into clear cups. Put 1-2 flavored ice cubes into each glass. As the ice cubes dissolves, the drink will change color and flavor – like magic. Mix all ingredients. This will give a great “magic brew” with bubbles and smoke. DO NOT drink until all dry ice has dissolved. Can also make ½ of a recipe.